Well that is RidingRound India done. After 30 days on the road I covered 3385 km by bicycle, 20km by tuk tuk, 180km by bus, spent 183 hours in the saddle, visited 8 states and cycled on some of the best and worst roads of the trip. I’m now in Chennai, formerly Madras on the South East coast of India, waiting for my flight to Singapore. After the past two and a half weeks where I cycled just over 2,500km to get from Chandigarh to here, I feel like I need a rest. When I arrived into Chennai I felt physically drained: from the heat and from the pace I had been imposing on myself. Thankfully I’ll have a few days before I need to ride again – here in Chennai and once I arrive in Singapore. The four days from Hyderabad to Chennai were fairly uneventful and I managed to eke out the 640km in spite of some annoying headwinds. 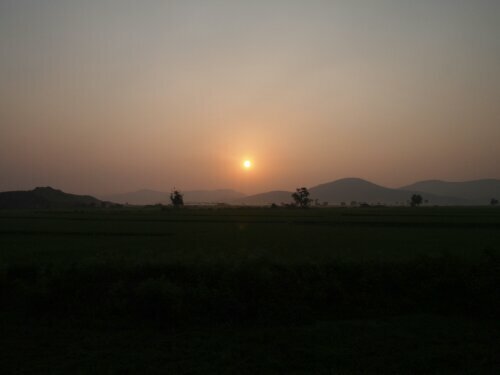 The landscape as I passed through the states of Andhra Pradesh and into Tamil Nadu had changed a lot from the north. There were more palm trees and I saw men who were gathering coconut and palm oil from them and everything felt much more tropical. 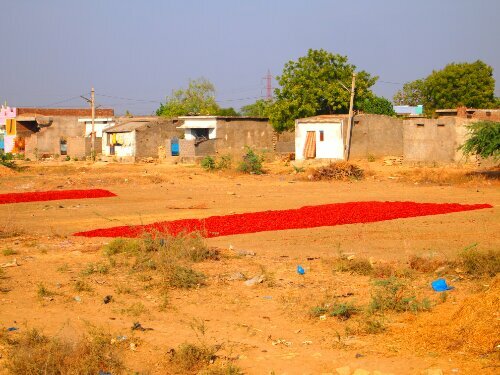 Their bright colours really standing out against the mud and dust they were laid out on. Interestingly Andhra Pradesh seemed to have a much greater Christian influence than the other states I had ridden through. Before I would occasionally see a Christian church or cathedral in cities but now there were many smaller churches by the side of the road and many shrines too. 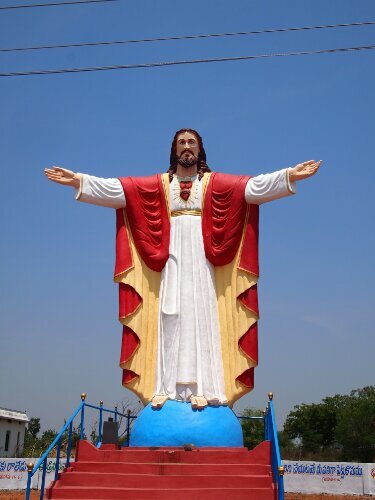 I would also see Jesus emblazoned across the front of trucks or on tuk tuks. The roads were also incredible throughout Andhra Pradesh – far better than in any other state I had ridden in – they were all smooth highways and they didn’t randomly disappear into mud or rocks when you least expected it. Even in the towns the roads stayed smooth which was a really big surprise. This meant I was able to cover ground quickly. The main problem riding was the sun and the heat. From 11am till 3pm the sun would beat down from almost right overhead sapping my energy and making riding more of a challenge. It would also make me more irritable and I apologise to anybody who tried to chat with me as I rode who I was short with as I was seldom in the mood for conversation. I also refused lots of requests to stop for photos as I would get much hotter if I stopped as the breeze from cycling was often the only thing stopping me from sweating uncontrollably and shady spots were rare. I was drinking far more water than at any time on the trip before. In Central Asia in the winter I could ride a whole day on just one litre, now I would drink four or five litres of water while riding with about 1.5 litres of soft drinks as well. No matter how much I drank I felt dehydrated. I also seemed to be eating less than normal, I don’t know if the heat was dulling my appetite or if I was drinking so much water with dinner my stomach was full of liquid! 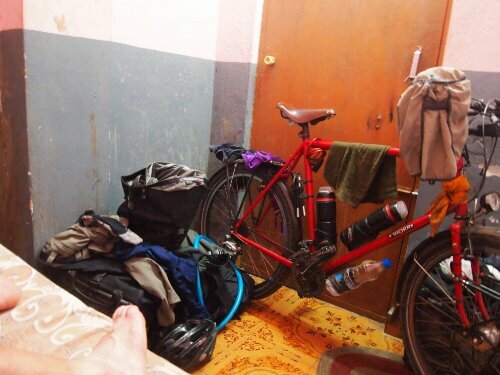 While riding this section I stayed in much cheaper accommodation than before – there seemed to be less budget hotels than there had been in the north and now there were very basic lodges. Also in this region for some strange reason they seemed to have decided to call restaurants hotels and hotels lodges or residencies. This was confusing to start with as people seemed to think I wanted to eat rather than sleep when I asked for a hotel. Everybody was very nice on the road and people remained very curious about me and my bicycle. Though no one seemed to believe me that I was riding to Chennai on the bike until I got very close to the city. At the beginning of the ride when I was still a couple of thousand kilometres away I had started to realise that when people asked me where I was going and I said Chennai they thought I was being rude. I may as well have said I was riding to the moon. The only unpleasant part of this section (excepting the heat and standards of hygiene in the rooms I stayed) was a meeting with some policemen. As I was riding into the town of Kavali just as the sun was setting after a very long day’s ride I got pulled over at a checkpoint. This was only the second time this had happened. The first time the policemen just wanted to say hello and ask where I was going and when I said I needed to carry on because of the heat they apologised and sent me on. This time the policemen tried to get me to come right off the road and over to their shelter. There were about five of them and three seemed curious about me and what I was doing while the other two looked less friendly. I didn’t particularly want to move further away from the road as I wanted to carry on as soon as possible due to the light. Thinking back this attitude was probably lucky as it is never a good idea to let officials get you somewhere private where they have more deniability of their actions. The one who seemed in charge and less friendly said he wanted to ask me some questions and check my luggage because of the elections. I couldn’t see what the elections had to do with me to start with and I definitely couldn’t see what they had to do with checking my luggage so I pointed at the sun and explained it was getting late and I’d really rather be getting on, thanks though! The last thing I enjoy doing is unpacking my bags by the side of the road as I have so much stuff. Looking back I guess I was once again saved by my lack of realisation when it comes to corruption. I am never expecting it and it must be obvious that I am unaware a bribe is required rather than that I am trying to avoid paying one so policeman just give up when they realise they will have to explain the whole concept to me. Those policeman were the exception rather than the rule and most people had a smile or a wave for me. Arriving into Chennai finally I rode immediately to a bike shop in order to drop my bike off for another service and to get it packed up for the plane so I can begin the next leg of my trip. Hi, really enjoyed reading your blog. 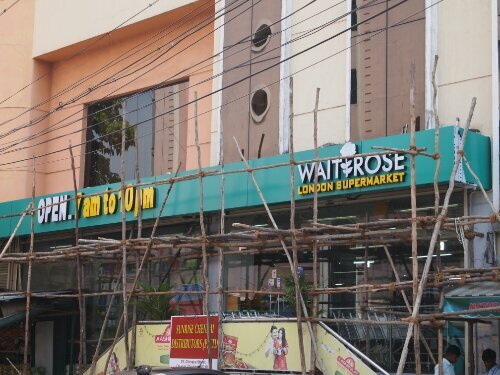 I am an expat living in Chennai. I just wanted to say that it is common place here in the run up to the elections to check that people aren’t carrying large amounts of cash for a political party to give out as bribes. I think that’s what they probably wanted to check for…. Good luck on your next leg!